I've seen one of these before, I believe from Paul Day's collection and featured in Tony Bacon's "The Ultimate Guitar Book" (which was actually co-written by Paul Day but the publishers left his name off because that's one of the weird and self righteous things that publishers do). 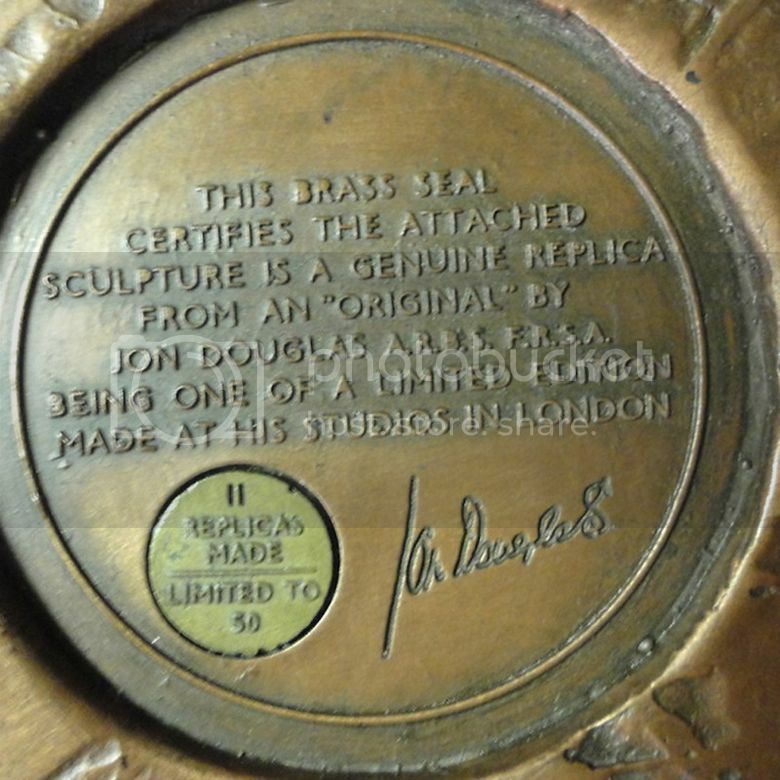 In 1975, sculptor Jon Douglas felt that most guitars looked "boring", and Ivor Arbiter, the UK distributor of Fender invited him to do better. 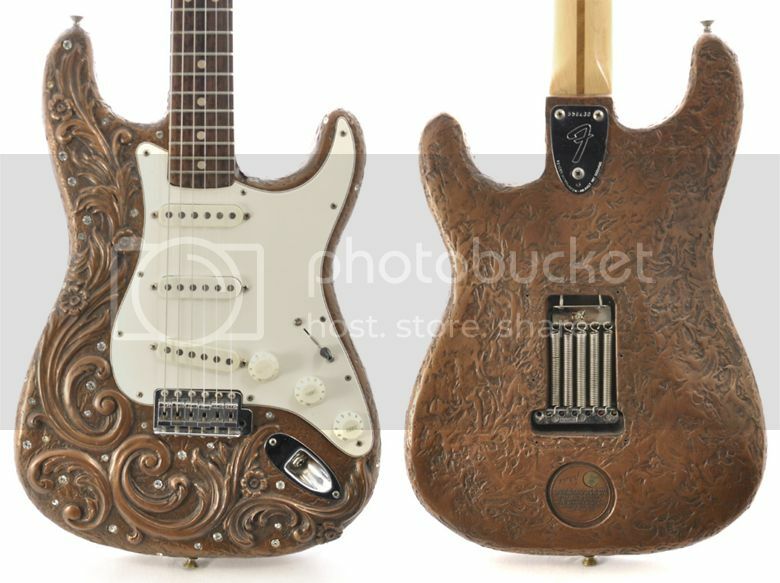 Douglas came up with a Stratocaster body made from cold-cast bronze, employing a metallic layer over a fiberglass shell. A prototype was made, followed by 6 more models. Arbiter suggested setting rhinestones into the body's surface, and the "Rhinestone Strat" was born. The small batch of Strats were put on sale at the Fender Soundhouse store in London in 1975, but unfortunately a fire destroyed the premises soon afterward. Two were sold prior to the fire, but the other four perished in the flames. In the early 1990's Douglas made molds for a future run of a planned 50. There is a plaque set into the molding on the rear of the body, numbered x out of 50, this being #11. 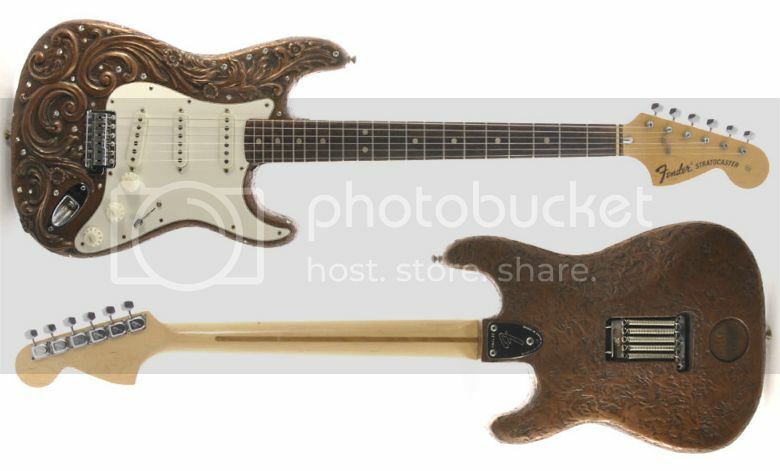 Douglas passed away, though, after only completing 25, making this "Rhinestone Stratocaster" a rare bird indeed! Some of the 25 guitars used actual parts from the 70s, some used modern components, this one is all 70s. A true legend. A true work of art. A rare piece of history! Currently listed on eBay with a Buy It Now price of $12,995.